Gluten Free St Andrews? What would be the options? The standard Starbucks and Costa coffee shops were there, the standard supermarkets were present and correct with their usual free from options. But what about something more unusual, more local? Something traditionally Scottish perhaps. Particularly since I was in a such a beautiful part of Scotland. Happily I discovered a delicious range of gluten free cakes handmade by Catherine Baker of the Auchtermuchty Cake Company. St Andrews is a lovely town on the East of Scotland famous mainly for its University and being the “home” of golf. I love St Andrews. It has a really good “feel” about it. It is a lovely mixture of beautiful historic buildings, gorgeous sandy beach and student buzz. It is small so it is easy to get around on foot and the golf courses give it a nice open aspect. St Andrews has a monthly Farmers Market on the first Saturday of the month. 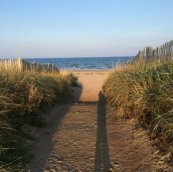 Would I find gluten free in St Andrews? Yes! I discovered the Auchtermuchty Cake Company as well as some savoury options. But before I get onto cakes! There were a number of savoury options available at the market. 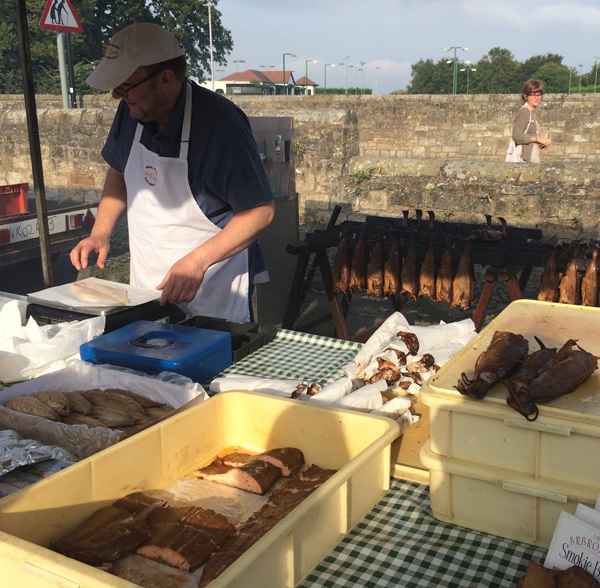 My favourite was a wonderful stall smoking and selling delicious Arbroath Smokies. 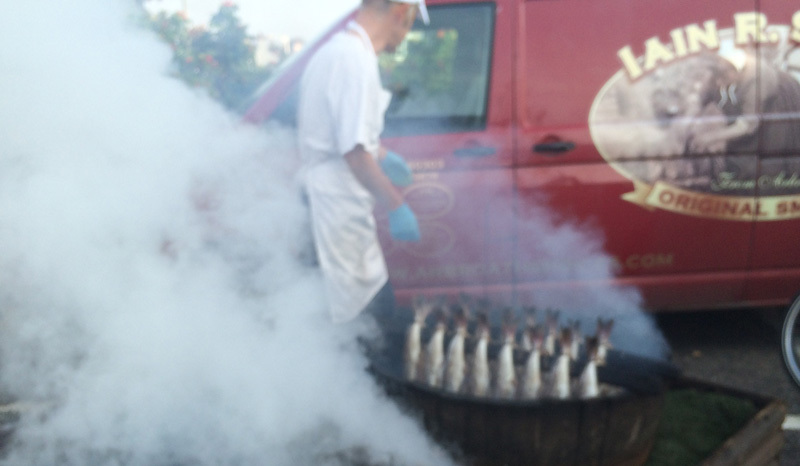 These smoked haddock are traditionally Scottish and delicious for breakfast. Or, as I had mine, for supper with some new potatoes and fresh vegetables purchased from one of the two vegetable stalls at the Farmers Market. There were number of meat stalls, one focusing on venison, another offering gluten free sausages. Also cheese stalls and a chilli chutney stall whose products were gluten free. The Auchtermuchty Cake Company was a real find. I was very impressed with Catherine's range of products particularly when I heard she made everything herself. I know from my own experience what hard work it is. There was a queue at the stall the whole time I was there, with many repeat customers. They were delicious. In my experience it is rare to find consistently high quality with great flavours and textures across all gluten free products. Bakewell tart is one of my favourite cakes and one I do particularly miss. I haven't been able to find a really good gluten free iced version so I was really looking forward to trying it. 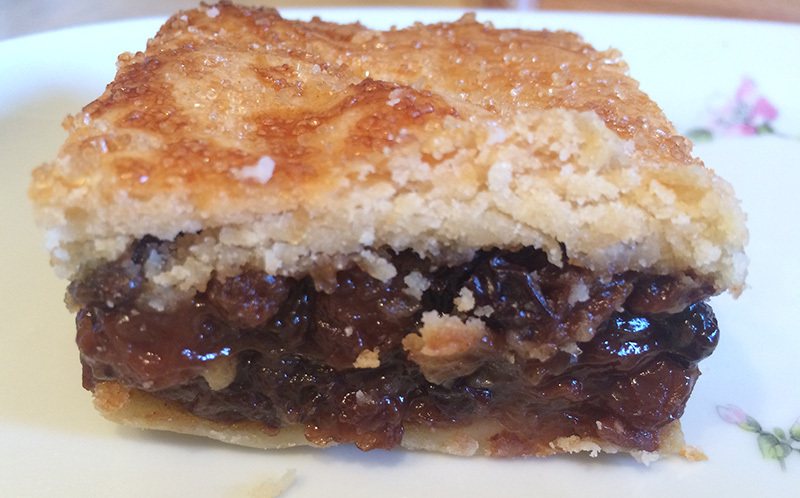 This tart was moist with good flavour and the pastry was nice and thin. 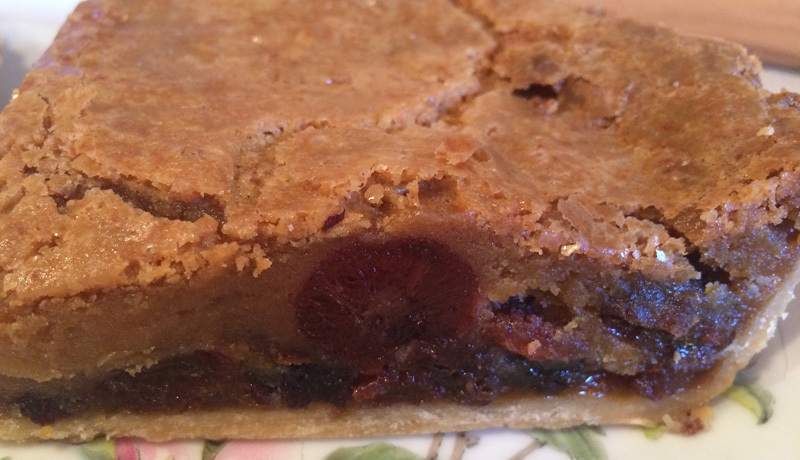 The whole tart worked well together in terms of texture and flavour. It is worth noting that the pastry lost a bit of its texture the following day, so this is one best eaten fresh. I suspect you might not find that a problem if you are a Bakewell Tart lover like me. I particularly liked the cheese frosting on the carrot cake, I love icing and there was a lovely generous portion on these carrot cakes. And, as you can see from the photo, it has an extra seal of approval having won a Great Taste Award. Fruit slices or "Fly Cemeteries" are a really traditional Scottish cake and one I used to love as a child. A good fly cemetery consists of a thick moist layer made from dried fruits sandwiched between pastry. This was a good one! Traditional Butterscotch Tart, with a twist! I also tried the Butterscotch Tart. This had a twist in that it contained cherries and other dried fruits. I liked this addition to the filling as it added texture. 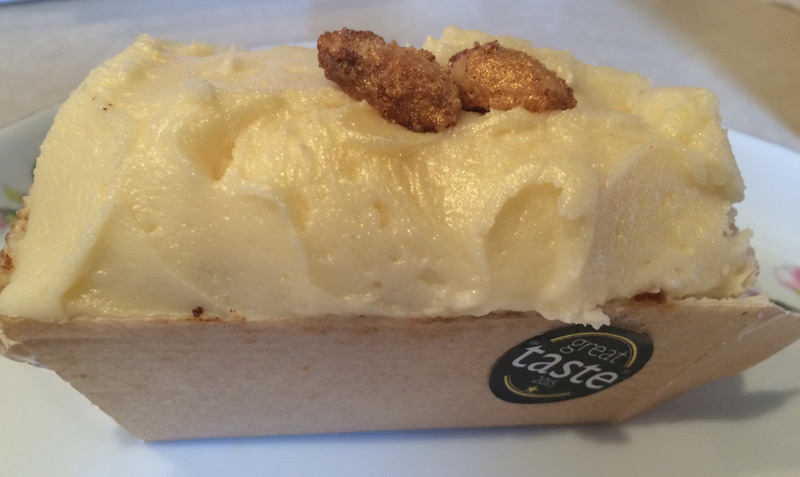 Not only is Catherine’s carrot cake a Great Taste award winner but she has also won a 2015 Great Taste Award for her Creole Fruit Cake which is stocked in Selfridges in London. Need to scale up production? Use your garage! I was very interested to hear that Catherine has recently converted her garage into a kitchen to give her the facilities to scale up to meet demand. Developing your food business from what you can achieve working in your own kitchen to a more commercial operation is where many start up food businesses falter. Catherine's investment in new facilities and the quality of her products makes me think that the Auchtermuchty Cake Company could be a brand to watch out for. Gluten free in St Andrews? - Yes! 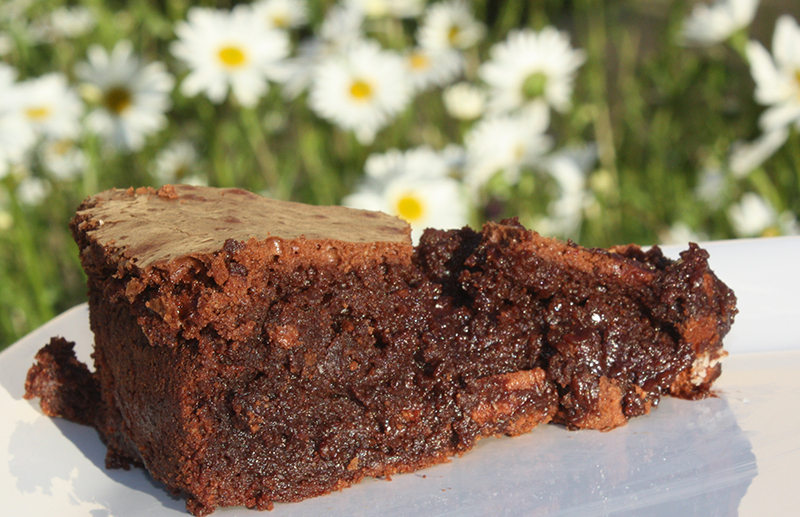 It was lovely to find a range of gluten free cakes and savoury foods on my trip to St Andrews. I was particularly pleased to find traditional handmade Scottish foods to enjoy.